The products of the hemp plant are wonderfully versatile. For generations, its seeds, oil and fibres have been used for various purposes from construction, paper production, and making clothing to consumption as a great source of nutrition. Hemp is a variety of cannabis plant with several important distinctions. Hemp is low in THC, the compound with psychotropic properties, and high in CBD. Oil extracted from hemp seeds is rich in omegas 3 and 6 and contains all essential amino acids as well as a plethora of vitamins and minerals. It is also a great source of protein and high in antioxidants. For this reason, hemp seed oil has been used to make a variety of health and beauty products. Hemp is natural, free from chemicals, and safe for all the family. Among its many listed uses are skin and hair care. 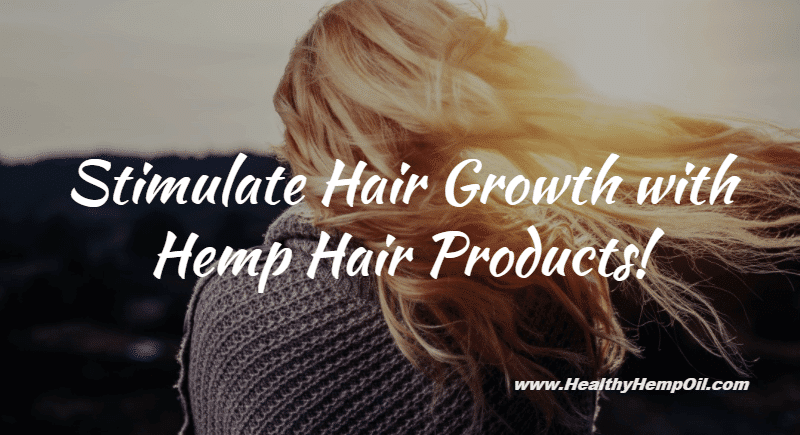 Let’s look at how hemp hair products can benefit hair and combat common hair problems (and if you’re interested, check out the hemp oil skin benefits here). How can Hemp Hair Products Help? Embarrassing dry itchy scalps, hair with a lacklustre texture, and hair loss are common complaints when it comes to bad hair days. A lot of these problems can actually be caused or worsened by the hair products you choose! Many shampoos can dry out your hair and scalp by removing the natural oils that your scalp produces. Many of the sulphates and added ingredients are responsible for washing out this natural oil, which is there to protect your hair. So how can hemp hair products help? Products with hemp oil can beautify from inside and out, and a lot of their powers come from the natural richness in fatty oils. Hemp oil can benefit the look and feel of your hair in three ways: by providing moisture and nourishment to hair and scalp, boosting protein to strengthen hair, and even stimulating growth. We’ll take a look at these in more detail. Moisture loss from the hair and scalp is a key factor in causing dryness. Fatty acids and vitamin E, found in hemp seed oil, prevent water loss due to something called emollient action. This can help soften the hair and reduce tightness and itchiness in the scalp. In addition to this, the ceramides also found in hemp seed oil help preserve moisture and protein levels within the hair. Hemp oil products are especially beneficial in winter; they combat the cold, harsh air. Hemp oil is readily absorbed by skin and hair without a greasy feel. To grow, hair needs Gamma Linolenic Acid (GLA), which is an Omega 6. This is found in abundance in hemp seed oil. Using hemp hair products, which are high in this essential fatty acid, can combat hair loss. People suffer from hair loss for various reasons. Dry, itchy scalps or eczema can add to hair loss, and the moisture provided by hemp oil can improve this. Hair loss can also be due to heat damage, and hemp oil can help to repair the damaged membrane, making it possible for new hair to grow. Hair is made of protein called keratin. Often, when we’re having troubles with pesky split ends and hair breakage, it can be because of a lack of protein. Using a shampoo high in protein can help replenish hair’s protein content, strengthening from within. Hemp oil is 25% protein, so a hemp oil shampoo can be used to combat weak hair prone to breakage. As well as supporting hair’s protein structure, the extra moisture hemp oil provides improves hair elasticity, preventing breakage due to brittleness. Consuming hemp seed oil helps too. In addition to the benefits of washing hair with hemp oil shampoo and conditioner, adding hemp oil into your diet is a great way of cashing in on all hemp oil has to offer. Consuming foods rich in polyunsaturated fatty acids, like those found in hemp seed oil, can stimulate hair growth. Also, similar to how protein rich hemp oil hair products can strengthen hair, consuming this protein in the form of hemp seed oil can boost this strengthening. Cibaderm makes hemp hair products that are natural, free from artificial additives, and boosted with extra herbal extracts and oils. The following products are suitable for all hair types and great for replenishing shine, moisture and texture to hair. Hemp shampoo 16 oz: This deep cleansing, gentle shampoo comes with 10 mg of pure hemp oil inside each 16 oz bottle. It’s free of damaging sulfates and made only of natural products. With all the benefits of hemp oil plus added herbs, it smells great and leaves no residue, unlike many common shampoos. Hemp conditioner 16 oz: This all-natural conditioner allows your hair to repair itself, providing your hair and scalp with plenty of moisture without leaving hair feeling greasy. It’s infused with vitamin E and other beneficial herbal extracts. All the chemicals and sulfates in many commercial hair products can be potentially damaging. If you’re looking to combat some bad hair day blues, it makes sense to choose a natural and nourishing alternative. Do you think it’s necessary for hair product companies to put harsh chemicals and sulfates in their shampoos and conditioners? Do you have any success stories of switching to hemp oil hair products? Let us know in the comments section.